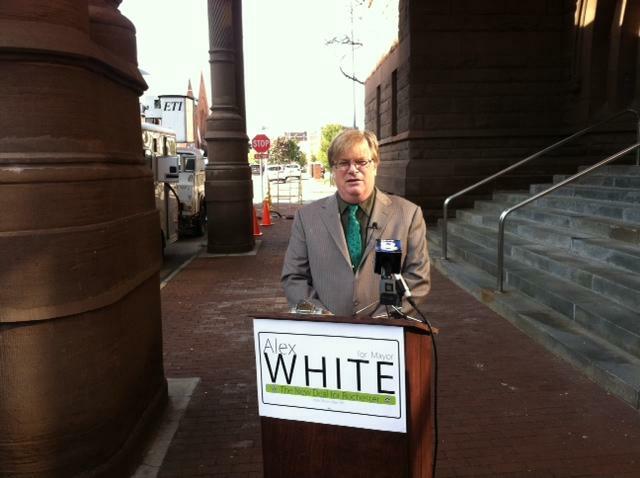 White Calls Drug Free Zones "Rights Free Zones"
Green Party candidate for Mayor, Alex White, says a new law up for consideration by City Council allows for Rochester's Police Chief to impose Marshall Law over parts of the city. The Drug Free Zones ordinance is designed to prohibit loitering for the purpose of selling drugs in defined areas. But White says it gives police the right to arrest anyone standing on a street in a group of more than one. It allows them to arrest anyone who shows any signs of possible drugs. And it gives them the right to determine where to go to enforce these laws, at the discretion of the Police Chief. White says he will release his plans this week to combat the drug problem. That includes his "10 pm plan" which he says relates to crime and addresses poverty. City Council President Lovely Warren issued a statement. She said "the presence of drugs in our neighborhoods hurts families, leads to violence and damages law-abiding businesses. Therefore, any and all proposals designed to curb drug-related crime merit our attention." Warren adds "City Council is still studying the proposal and we will not be voting on it at tonight's meeting." City Council member Adam McFadden, who introduced the proposal, is asking that it be held in Committee pending more public input.